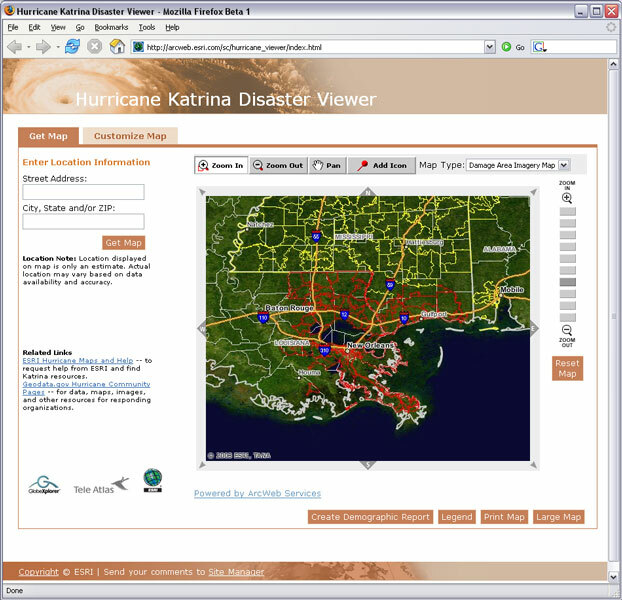 The Hurricane Katrina Disaster Viewer is designed to provide detailed information about impacted areas to responders, people affected, and the general public. The site lets you locate an address or zoom to areas of interest and view FEMA damaged areas, U.S. Postal Service affected delivery areas, post-disaster satellite imagery, population density, street maps, and much more information. You can also generate demographic reports. Too bad this wasn’t released last week because it is pretty good. The Viewer displays many of the ArcWeb services that are available such as topo, flood, traffic and weather that aren’t available on Google Maps. I think many of us GIS folks will enjoy the application, but the general public has already discovered the “Katrina” button on Google Maps so getting them to switch over to this is probably impossible. All in all though a great demonstration of ArcWeb Services.